The Scapular is a piece of fabric brought down from heaven from Our Lady of Mount Carmel, which was given to St. Simon Stock. 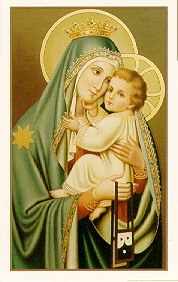 The Brown Scapular of Our Lady of Mount Carmel should have a deep meaning to us. It is a rich present brought down from Heaven by Our Lady herself. "Wear it devoutly and persevering," she says to each soul. "It is my garment. To be clothed in it means you are continually think of me, and I, in turn, am always thinking of you to secure eternal life." Most Rev. Kilian Lynch warned us against abusing the Scapular devotion. "Let us not conclude that the Scapular is endowed with some kind of supernatural power which will save us no matter what we do or how much we sin... Fidelity to the Commandments is required by those seeking the special aid and protection of Our Lady." We wear the Scapular because instead of saying to Mary that we venerate her, love her, and trust her, we tell her these things every moment of the day, by simply wearing the Scapular. The devils revealed to Francis of Yepes, the brother of St. John of the Cross, that the three things that especially tormented them were; the Name of Jesus, the Name of Mary, and the Brown Scapular of Our Lady of Mt. Carmel. "Take off that holy habit which snatches too many souls from us. All those clothed in it die piously and escape us," the devils said. Note: The Scapular Medal may be substituted when it is impossible or impractical to wear the cloth Scapular. Hower, the medal must be blessed by a priest. It is not necessary to have the cloth Scapulars blessed.